THE VOTE Has David Beckham’s first MLS season been a success? So how to review David Beckham’s first season in the MLS? Well, it was hit and miss, wasn’t it? Mostly miss to be honest. Becks played just 252 minutes all season (Landon Donovan played 2191 minutes) and didn’t score a single league goal, but still picked up a guaranteed $5.5m in wages. And LA Galaxy didn’t make the post season. On the plus side, Beckham’s arrival has generated huge attention and revenue â€“ merchandising, advertising etc. â€“ and attendances across the MLS are up on 2006. The money men will be generally happy with the way his first season has gone, but in terms of on-pitch performance, Beckham has been a dead duck, injured most of the time. Fans who paid for tickets to games that had been advertised on the back of Beckham’s appearance often had to settle for the sight of MLS’s saviour dressed in a suit, waving like royalty from the stands. Bust on pitch, don’t care about money men (except to the extent their decisions influenced whether he was fit to play). Overmarketing and then team/league hiding the extent of Beckham’s injury once he arrived are what lead to the level of fan anger. Always disappointing when a player you want to see is injured, but obviously people would be more upset after paying to see what had been hailed as practically the second coming. It’s been a miss completely, typical of beckham to take money and give nothing back. Obviously it’s not his fault he’s had relentless injuries. He hasn’t done anything to change how americans look at football (or soccer), they still prefer about 8 different sports, for the money they spent on him they could have got a few other players who are much, much better. I wonder what the program on Channel 5 about Beckham in L.A is like it must be c**p.
Anyway he’s been a complete failure so far and I thoroughly expect L.A Galaxy to buy Drogba!!!! The Galaxy could not buy without a change in rules. The Galaxy seems to have brokes even financially this year with potential to make serious money next year. The rest of the league made more money. With Beckham came some Cuahtemoc Blanco, a legendary Mexican player who is still at the top of his game. Off-pitch, Beckham has done a lot of good work. Missing the playoffs might be good for Beck’s ankle. Next year could be very interesting. Soccer is now ahead of hockey in both participation, attendance, and TV viewership. Fandom is split between three league (EPL, Mexico, MLS) and the international game. 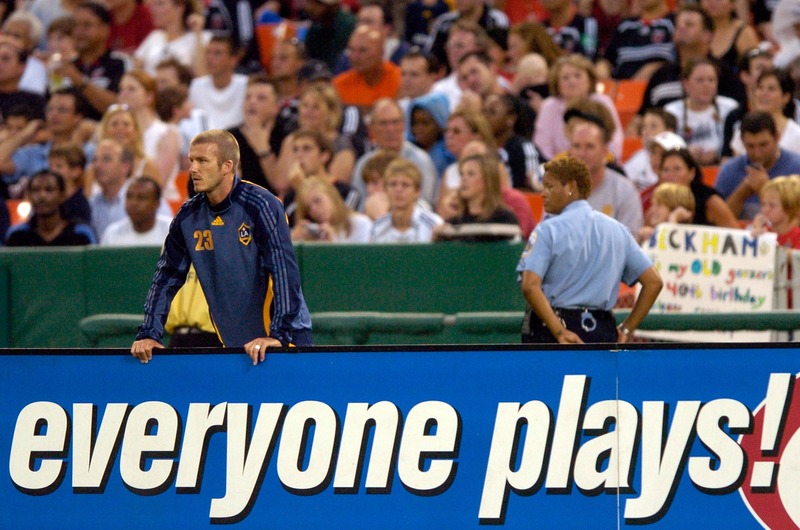 Before Beckham, MLS paid networks to air games. Now the reverse is true. This was clearly the right decision, given that it worked this well despite a serious injury. Obviously a disappointment on the field. His injuries just never allowed him to play. But – at least he was able to play some during the summer (ie during the slow season in American sports) and was able to draw attention to the league. His game in New York and DC drew massive crowds and since those games attendance has been up. 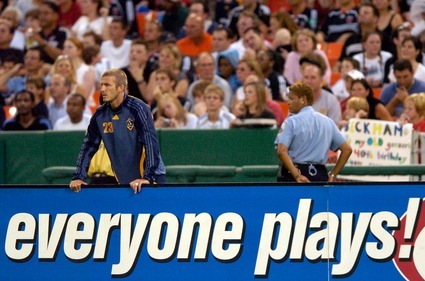 At the very least, Beckham helped MLS gain attention from non-mls soccer fans (and there are a lot). The most impressive thing about the game in Washington was how knowledgeable the crowd was about soccer. A huge portion of the crowd may have played soccer, watched the world cup, or even followed the EPL, but they had never been to an MLS game. Getting these people to follow MLS would be huge for the league. Beckham has helped that tremendously.